Protection Engineering Consultants (PEC) and Southwest Research Institute® (SwRI®) have teamed to develop and test a novel high-rate laboratory test procedure that utilizes high-energy nanosecond pulsed lasers to generate strong and short duration shock waves within solid materials. This technique can create strain rates on the order of 105 to 107–s-1 or higher in metals. This information is needed to model explosions and high velocity impacts with high-fidelity, first-principles software tools. The test setup is simple, consisting of a drive laser, beam shaping optics, a test fixture containing the specimens, and a photon Doppler velocimetry (PDV) system (Figure 1). The laser superheats the surface of thin foil materials, ablating the material and turning it into a high-pressure plasma. This plasma can generate a shock wave on a target or can accelerate a flyer that impacts a target and generates shock waves in flyer and target (Figure 2). Material properties were determined by analyzing the motion of the back face of the metallic foil. The beat signal from the PDV laser measurement system was transformed into velocity data via spectral analysis. The PDV signal was partitioned into short windows of time and the frequency content was determined with Fast Fourier Transforms (FFT). 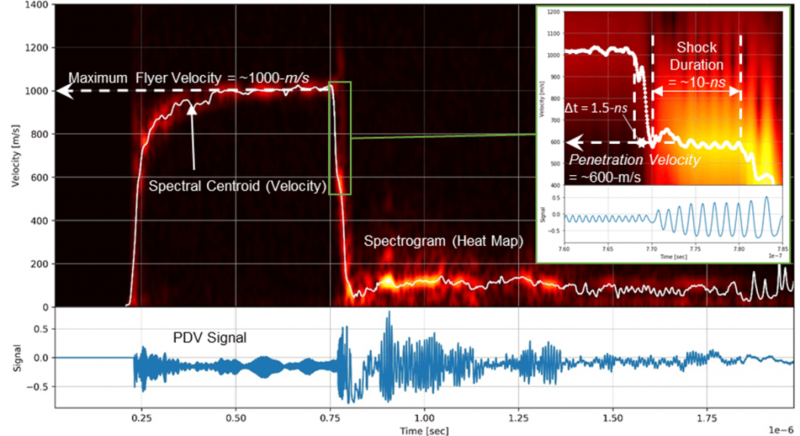 PEC developed a tailored digital signal analysis tool to generate spectrogram heat maps from the PDV beat signal to determine the target velocity (Figure 3). Overall, the laser-based testing successfully generated strain rates up to 107-s-1. Strain rates up to 108-s-1 are possible and reproducible with this technique. This approach allows multiple tests in a short period of time, with approximately five minutes between tests. For more information on PEC and SwRI® capabilities in laser-based material property measurement, please contact Dr. David Stevens or Mr. Matt Barsotti.